Garry McKeller, 17, was born and raised in Alaska. He began mushing in 1999 and has completed the Jr. Iditarod three times. 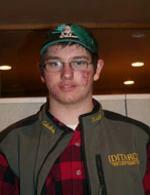 Last year, his fellow mushers voted for Garry to receive the Sportsmanship Award. He is homeschooled and is a senior in high school. He participates in small engines, welding and carpentry. He says he enjoys fishing, trapping and rafting. His goal is to become a river guide. He has worked summers two years out of Seward deck handing on a charter boat. This summer he bought a new raft to start river guiding and sight seeing out of Willow next summer. He plans to continue mushing and wants to run the Iditarod.